90 MINUTES IN HEAVEN—the story of Don Piper’s death in a highway accident, heaven, and his return to a life of severe physical, emotional and spiritual recovery—opens in theaters nationwide this Friday, Sept. 11. 90 MINUTES IN HEAVEN, based on Piper’s New York Times bestseller of the same name, has sold more than 7 million books. Written and directed by Michael Polish (THE ASTRONAUT FARMER), 90 MINUTES IN HEAVEN stars Hayden Christensen (STAR WARS, JUMPER) and Kate Bosworth (BLUE CRUSH, SUPERMAN RETURNS). It features Grammy and Dove Award winner Michael W. Smith, Grammy winner Dwight Yoakam, Fred Dalton Thompson (Law & Order), and E! News’ Jason Kennedy. Don Piper died Jan. 18, 1989, when a semi-tractor truck crushed his car. Declared dead by the first rescue workers on the scene, for 90 minutes Don’s body lay under a tarp. His soul, meanwhile, was in heaven—experiencing love, joy and life more real than he’d ever known. When another pastor’s prayers helped bring Don back to life, he became a living miracle. Yet this is one miracle Don wished never happened. Heaven’s bliss was replaced by excruciating pain and emotional turmoil. With the support and prayers of his beloved Eva, their three kids and friends near and far, Don clung to his faith in God and fought to regain a semblance of his previous life. The Piper family’s incredible true story of perseverance and overcoming the challenges of life—and death—brings hope and encouragement to all who see it. Starring Hayden Christensen and Kate Bosworth, 90 MINUTES IN HEAVEN is based on the inspiring New York Times bestseller with 7 million books sold. In theaters everywhere this fall, hope lives. Can ‘Heaven Tourism’ Stories be Trusted? When The Boy Who Came Back from Heaven was revealed to be fabricated, publishers rushed to pull it. What about other accounts? 90 MINUTES IN HEAVEN details Don Piper’s immediate death from a head-on collision, his 90-minute visit to heaven and his return to a life of faith-shaking pain and physical rehab. For years he held the story close. “Piper struck me as a reliable witness,” Christianity Today editor Mark Galli wrote. “Piper simply had the look and sound of sanity, of someone who was telling the truth, whose word was his bond.” Talk to filmmakers about their focus on the true telling of a true story. When has a film company formed to give all profits to charities that help women and children? 90 MINUTES Producer Rick Jackson founded Giving Films as a “giving engine.” Ask Jackson about his business-driven philanthropy—and why he begins with 90 MINUTES IN HEAVEN. Growing star power and box-office numbers reflect the maturing of faith films. 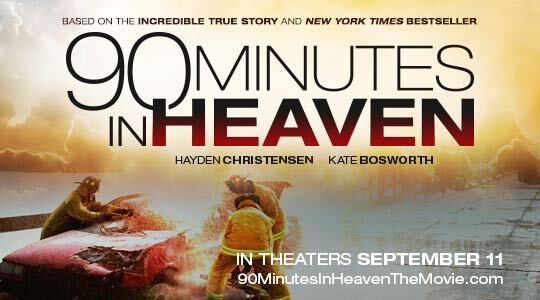 Talk to Hayden Christensen (STAR WARS, JUMPER) and Kate Bosworth (BLUE CRUSH, SUPERMAN RETURNS) about their attraction to 90 MINUTES IN HEAVEN. Giving Films tells stories that reach faith-and-family film audiences through high-quality production and storytelling and open doors to wider audiences. All profits from Giving Films go to charity.